FITZ Partners offers customised Board Reports and fee review analysis to asset managers, allowing a detailed independent review of the funds share classes on cost and performance. FITZ Partners handles the full fee review and benchmarking process from peer group construction to the publishing of high quality pdf reports directed at fund directors or fee committees. The thorough fee review can be customised but would contain detailed benchmarking of each of the client’s share classes across a choice of fund fee components relative to a selected peer group as well as a sub-peer group restricted by fund product size. Other FITZ Partners unique fee categories can also be used in the peer group construction (performance fee, fee caps, minimum investment etc…). 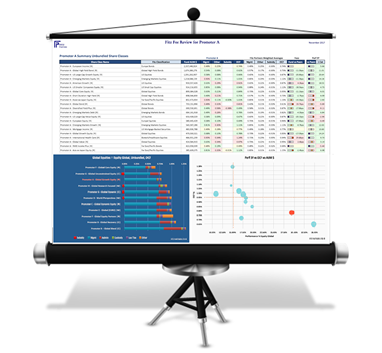 Fitz Board Reports are intended to allow fund boards and fee committees to review, in one place, all relevant share classes using a consistent methodology and relatively position products on value through fee and fund performance quartile indicators.